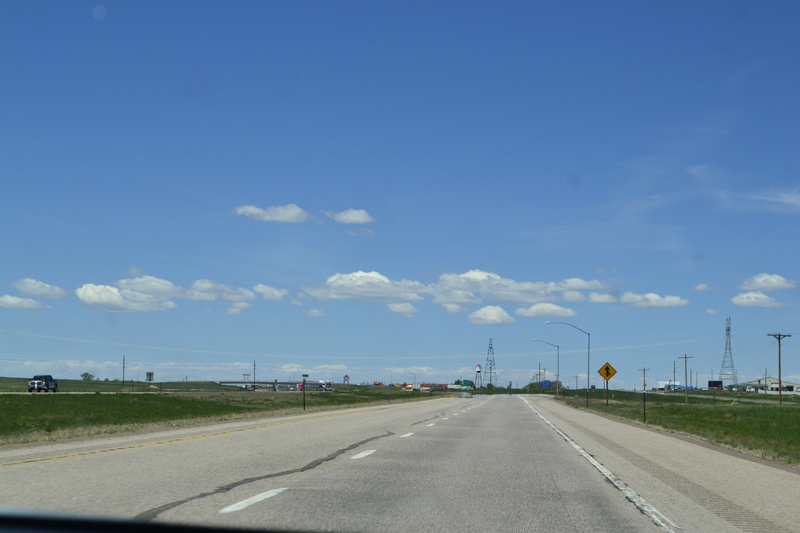 I don’t remember where I took this photo… Nebraska? South Dakota? All I remember is my daughter was driving and the windows were rolled down. When I got home I was restless . . . in fact, the next morning I felt drawn to the car, missed the car. Don’t get me wrong, I loved being home, seeing MEH (My Engineer Husband) most notably. Sleeping in my own bed, having a private bathroom (not a fan of public restrooms—is anyone?). Mostly I missed the sense of adventure—what will I see today? In the previous sixteen days of travel, I almost went international. When I came within 13 miles of Mexico (in Arizona) and less than 17 miles from Canada (in New York), I listened to only Spanish speaking radio stations then just three days later listened to stations in French. I wished I had my passport because I briefly toyed with dashing across each border, just because I could. That’s what I miss the most. The possibilities. Letting the road take me where it would. Even if I stayed on the purple trail drawn out by my GPS, there was the possibility that I could follow the sign to the bridges of Madison County or take a detour into Cleveland or visit one of the many bird sanctuaries I passed or one more rest area in Minnesota or Ohio or even the rustic ones in Arizona. There was also the possibility of visiting more friends and family . . . as it was, first my daughter and I together, then I alone visited a total of seven homes: 21 people, 4 cats, 5 dogs, 1 horse. We also stayed in six hotels. I met two wonderful blogging friends for the first time in real life: Shary Hover and Melissa Crytzer Fry. I laughed and cried with and hugged a million times two friends I’d missed for sixteen long years since we moved from Colorado to Maine. 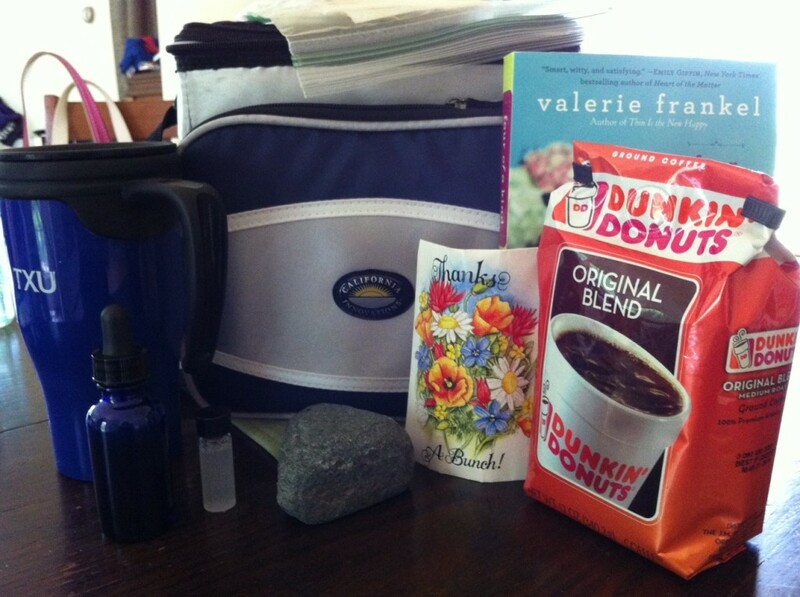 Some of the things our wonderful friends and family gave us along the road… thank you for the coffee, the coffee cup(! ), the lunches, the lunch box(! ), the potions, the flower seeds, the book, the rocks… but mostly for the care! Not shown… the maps and directions you often gave us. Thank you for those, too! I talked to a few strangers, but only a few. In fact, that struck me. How very solitary my trip became after I dropped my daughter off in California. I visited my friends, but otherwise, I talked to very few. Don’t get me wrong, that was okay with me, but it was surprising… and it seemed like a big change from the last time I was a cross-country traveler. It made me wonder. Has the world changed? Or is it me? Or them? I don’t know the answer to that question, but I thought about that a lot, too. The people I did talk to were respectful and kind, but few expressed an interest in what I was doing—did I express an interest in what they were doing? I think so, but everyone seemed more reserved than what I remembered from my last long travels (that was many years ago). Have we become warier about talking to strangers? I hope not. That’s such an important part of life—sharing the stories, gaining understanding—or at least for me it is. This is getting long, I know, but a few more thoughts, that’s all—for me as much as for the blog—did I have ideas? I mean for writing? That was, after all, one of my goals, I even wrote a post about it for Writer Unboxed. So did it work? The short answer is yes. The longer, more complicated answer is no. What can I possibly mean by that? If I thought I’d get a lightning strike for an idea (like I did with my last book, that I’m now querying)—and I kinda sorta thought I would—I didn’t, but I did get lots of bits and pieces of ideas. I’m not sure how, but they will work their way into whatever I write next. The feel of the road, if nothing else. Because more than anything, that’s the story behind the trip. I loved the feel of the road, the grip of the steering wheel, being the master of my destiny—at least for that day, that mile. It was heady and exciting and fun, even on the hard, long driving days (see the things I’ll miss list at the end of this post). Would I do it again? In a heartbeat. Should you do it? Yes. And what would I say to the lady at AAA if she asked again if I was nervous about driving across the country by myself? Meeting blogger friends on their home turf! Not caring what I wore or how I looked (although I felt bad for the people we visited that I looked SO rumpled). By the way, my daughter always looked beautiful and unrumpled wherever we went! Being anonymous; not worrying what people would think of me, especially when I was rocking out and singing at the top of my lungs! Sleeping in a different bed every night—I don’t sleep well away from home so I was pretty tired by the end! Wow! Julia, I am still in awe of you adventure, and as I’ve said to you before, I know you’ll be processing this incredible trip for a long, long time. Yes, I think you’re right, Erika — I’ll be processing this trip for a long, long time AND it will stay with me for a long time… at least until I take the next (because there will be a next, of course!). Being in the moment was THE BEST, you’re right about that, too. Thanks for your kind words, glad you enjoyed it! Your stats are amazing and I love your random recap. (BTW… you didn’t look rumpled in San Diego.) You’ve captured that “on the road” feeling so well. When I take long trips, I’m usually just pushing on to get to my destination, but even though I know I probably won’t take a detour, the knowledge that I could is very freeing. As you say… it’s the possibilities. And now you’ve got me thinking about how we react to strangers and how they interact with us. I do sometimes talk to people at gas stations or rest areas when I’m on the road but there are generally only two topics of conversation. One is Lola, of course, and the other is my Mini Cooper. Otherwise, we all tend to stay anonymous and stick to simple hellos or friendly nods. I always assumed it was because I’m shy and that people sense that and don’t talk to me, but maybe we are all more closed off. I wonder. Thank you, Shary 🙂 I was most definitely feeling beyond rumpling when I arrived to see you, so you are very kind to say otherwise! I can see how Lola would be a conversation starter, she’s the sweetest! And your car, too — love it! Maybe it was because I was driving the standard blah sedan and people thought I was in the witness protection program?! Also, like you I tend to be shy and introverted, so maybe that’s it, too? What a beautiful, moving post, Julia. This was a life-changing experience, I think – and all I hoped it would be for you! I especially LOVE that you made the effort to “be” in the moment, sans camera and phone. I know – coming from me – that sounds strange. But I once wrote a post about that … whether it’s better to just witness “the” event — and LIVE it — or search for a camera so that you can share it with others later. The reality is – as you pointed out – that the lens is distracting and takes away from the “thing” as it’s happening. I’m all for living. And it sounds like that’s exactly what you did. I’m so glad to have been a part of your adventure. I agree with Shary: the stats are impressive. So are you for making that solo trek back. I admit I’m a tad bit jealous. I want to hit the open road, with the windows down, singing at the top of my lungs. p.s. about the camera, I remember that blog! a good one. And it was really a balance, I’ll tell you. I’m regretting TIMES I didn’t take pics, like in the canyon I drove through after leaving your house. But that might’ve been just plain dangerous to stop frequently… not to mention it would’be taken me forever. I LOVED that canyon! I have to admit, when I first heard you’d be making that trip back by yourself I was worried, because I can’t imagine doing such a long trip all alone—I fall asleep at the wheel if I’m alone more than two hours! But reading this and your other post, I’m in awe of you, and I can see how it’d make you feel empowered! It’s an interesting point you bring up about us no longer being as “open” with strangers. I can’t speak to how it was years ago, but I will say I think part of it is regional. People in Austin are much more likely to just start chatting up the person next to them than they are in my hometown of Miami. When I visit, it’s an odd thing to adjust to, because I’ll try to smile and talk to strangers, and they almost seem frightened of me. So glad you’re home and that you had such a great trip! Fun wrap-up of your trip. I loved our cross-country trip. I loved seeing the diversity across our country, both of the landscape and of the culture (as exhibited by stores, billboards, and landmarks). Glad everyone got where they needed to be safe and sound. I would love to do an all girls road trip sometime with friends– I think that would be a blast. So glad you had a great trip, too, Julie! The diversity was so fascinating, I agree. And I too am glad we’re all safe and sound now. As for the girls trip, I agree, that sounds like fun! I think that was part of the fun of my daughter and me alone! I’ve always wanted to do something like this. What an exercise in self-reliance. I enjoyed reading all about it. Sounds like a fabulous trip. So wonderful you got to share it with your daughter (half of it, anyway) and friends and family and critters. As for myself, I am quite grateful for rest stop bathrooms. because, well, think of the alternative. I ain’t no Wendy Davis. It truly was fabulous, Beverly! (Yes, the half with my daughter was wonderful to share, just priceless.) As for Wendy Davis, I had to look her up… and no, that’s not me either especially when you add coffee to the roadtrip mix! However, as much as I appreciate rest stop bathrooms, some are definitely less appealing than others! Haha. This is such a great wrap up of the trip! I’m glad you wrote, kept careful notes about the trip, took pictures, etc. And how cool that you could feel empowered by this trip and KNOW that you COULD do it again. Wonderful to have something you enjoy be something attainable and not “Oh, I would love to fly to the moon.” You know what I mean!? I’m glad you enjoyed the wrap up, Nina. As for the careful notes… the way home I took NONE and the way there, my daughter had moments when she reminded me she wasn’t my scribe. Yes, I do feel empowered and that it’s a something I love doing that is attainable! I’m so glad you liked reading about my adventures — and that you can relate, Christina! Yes, Colorado is WOW, I agree! Add to that the emotion of both my kids being born there… and… yes, missing that feeling, and “aching” is a perfect way of putting it. I also know what you mean about never being in the pics; I’m guilty of that as well. I’m learnign to force that as well 🙂 Thanks for sharing your road trip experiences! The great American road trip! Steinbeck did it. Kerouac did it. Paul Theroux did it. There’s something about the pull of the road. It’s so freeing and expanding. And there’s something about journeying to a place, going overland, rather than being sealed up in a plane. I loved reading all your stats – qualitative and quantitative. I bet bits and pieces will work their way into your writing in the most unexpected ways. You’ve done something most people just dream about. I hope I get to do it someday too. Thanks, Jackie! I hope you do get to do it someday, too! I didn’t even think about (before I left) the literary history of the pull of the road. But I sure did once I was on the journey. I agree, going overland is very different than being in a plane… and I’m expecting it will work into my writing in unexpected ways. Head south so you can live out the song. Stay with us…then I’ll head down to Florida with you! I know what you mean about just going. It’s very liberating. I would LOVE to head south (I’ve never been further south than Missouri (except in the southwest). Thank you for the kind invitation, and you know I might take you up on it! Then to Florida (never have been there either! )…I’m thinking next late winter. Love this post, Julia! Not only for the tales of your adventure, but because you echoed so many of my own thoughts and feelings, e.g. how important it is to talk to strangers, wondering if you expressed an interest in those you met, being present and seeing things differently. And how bittersweet it must have been to drop your daughter off (hope her new job is going well). The Dunkin Donuts coffee made me laugh — it’s so awful, yet my Massachusetts-born hubby gets so nostalgic about it. Look forward to reading more from you and good luck with your querying (I shall be starting that soon myself! ).